The rumored midrange battle horse of Sony's 2013 stable - Xperia C5303 HuaShan - has leaked in its full glory a month before the expected launch at the MWC expo in Barcelona. 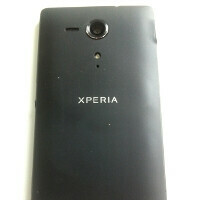 The handset sports an already familiar design that we've come to associate with the Sony Xperia Z and ZL, mainly on account of the circular metal power key in the middle of the right side, which is apparently going to be Sony's Xperia trademark look this year, as we saw it in the Xperia Tablet Z as well. Other than the lock button we notice a fairly compact body with on-screen navigational buttons, again something typical for Sony, while the side screw and relatively thick chassis might be pointing at Sony waterproofing this device too. According to the leaked benchmarks the C5303 HuaShan sports a 4.3" HD display, and here in the photos we can see the prototype running Android 4.1.2, but little is known about the other things that make it tick under the hood, except for a rumored 1,800 mAh battery. In the benchies that handset was running a 1.7 GHz Qualcomm MSM8960T, which is a chipset compatible with the China Mobile network, so with what silicon are we going to see it in the rest of the world, if it ventures outside China, is anyone's guess, though if we have to bet we'd put our chips on the Snapdragon kind. I think it's something b/w 4.3 to 4.7 inches..
TRANSPARENT ANTENNA! AT THE BOTTOM! I thought Sony abandoned it! 4.3 inch display. Add that. Nice device.am still getting Z though.